The Pool Frog Leap Mineral Water System is designed to make the maintenance of an above ground pool easier and less time consuming for pool owners. The system uses pre-measured chlorine Torpedo Pacs and an Anti-Bac Mineral Pac that are easy to switch out and replace and are also recyclable. Being that the Torpedo Pacs are already measured, you can say goodbye to having to purchase and store large chlorine buckets in your home. Another added benefit of the Pool Frog Leap Mineral Water System is that it uses chlorine and minerals to clean your water. This results in a pool that requires 50% less chlorine than if you were using normal tablets or granular chlorine to treat your pool. The water will feel softer on your skin as well as your hair, eyes and bathing suits. Unlike Saltwater Generators that can only be used on specific pool models due to the corrosion issues caused by the salt, this system can be used with any pool model. The patented control dial on the front of the Infuzer lets you manage the amount of water flowing through the system. Water is circulated upward into the Anti-Bac Mineral Pac and chlorine Torpedo Pac simultaneously. The erosion design of the system continuously dispenses chlorine at a precise low level (only 0.5 is needed). Once you’ve determined the correct setting for your pool just set it, then forget it for weeks at a time. 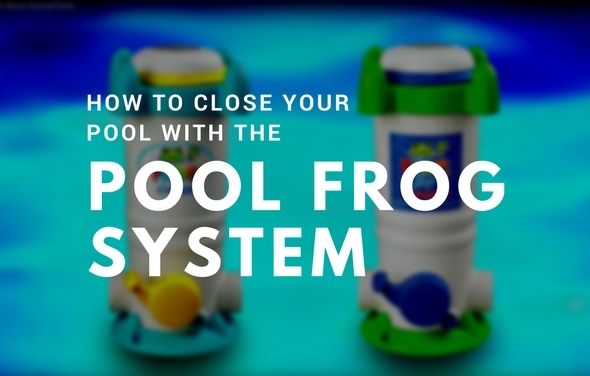 The Pool Frog Leap Infuzer is a water treatment center that controls the flow of water to each part of the FROG Leap System. This is ideal for pools up to 25,000 gallons. Pool Frog Leap utilizes the proven technology of Pool Frog minerals with the increased value of 25% more water polishers and easier pool start up and winterizing. The patented control dial on the front of the Infuzer lets you manage the amount of water flowing through the system. 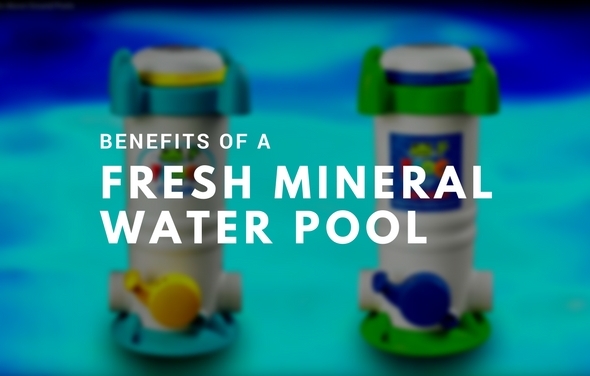 The Pool Frog Leap Anti-Bac Mineral Pac holds the minerals and fits inside the Pool Frog leap infuzer. This must be replaced every six months after one pool season whichever is shorter. 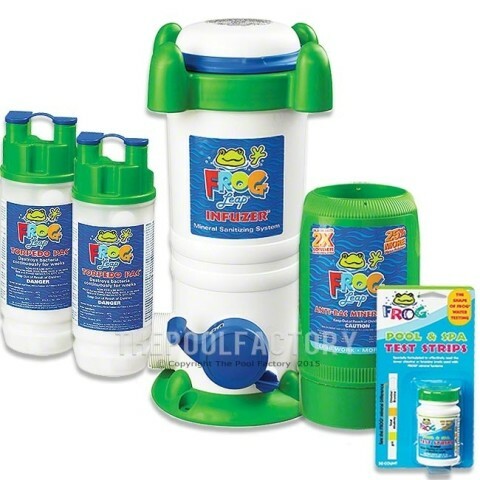 Pool Frog mineral technology that destroys bacteria and neutralizes acids which helps keep the pH in an acceptable range with less monitoring. The Anti-Bac Mineral Pac is a leap ahead with 25% more water polishers while allowing chlorine to last 2X longer than standard chlorine treated pools. The Pool Frog Leap All Out! is used with the FROG Leap System for a 90-Day Algae Free Protection Guarantee. Pool Frog’s All Out Algaecide provides pool owners with a an effective algae killer that will work with Pool Frog Leap feeder system, keeping your pool algae free for 90 days if proper chemical balances are maintained. 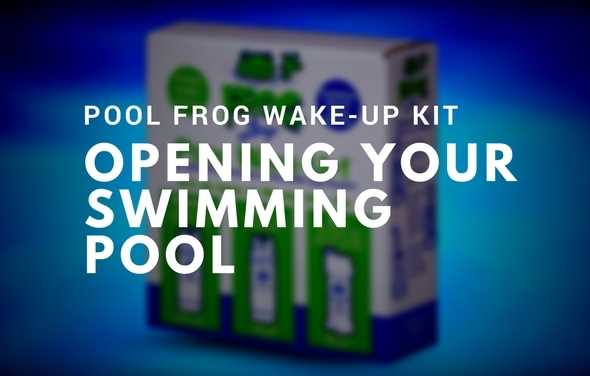 The Pool Frog Leap Torpedo Pacs are pre-filled with chlorine tablets and fits inside the Pool Frog Leap Anti-Bac Mineral Pac. Pool Frog’s Leap Torpedo Pac provides pool owners with a way to supply chlorine to their systems slowly and steadily, enabling maximum chlorine effectiveness. I purchased this system and it does not seem to be working. Torpedo pac is still full. what could be the problem? Try priming the Torpedo Pac first by dunking the Pac in the pool and hold under water until it is partially filled with water. Then put it into the Frog Leap Infuzer. Also,set the control dial on the Frog Leap Infuzer to 10 and run your filter system for 24 hours and then re-test the chlorine level. I have the opposite problem. I put in a new torpedo pack and even if set to zero all chlorine is gone in two days, it seems to not make any difference where I set the infuser and my pool water gets way high on the chlorine level. Any thoughts?